If you are hosting an Easter celebration at your home, it probably means that you will be entertaining guests of all ages. Luckily, we have plenty of ideas to keep your holiday as stress-free as possible! Easter celebrations usually mean pretty brunch spreads, Easter egg hunts, and Easter craft activities. Some of the greatest memories I have from Easters past are watching my daughter joyously anticipate the Easter egg hunt while we worked on crafting projects together. 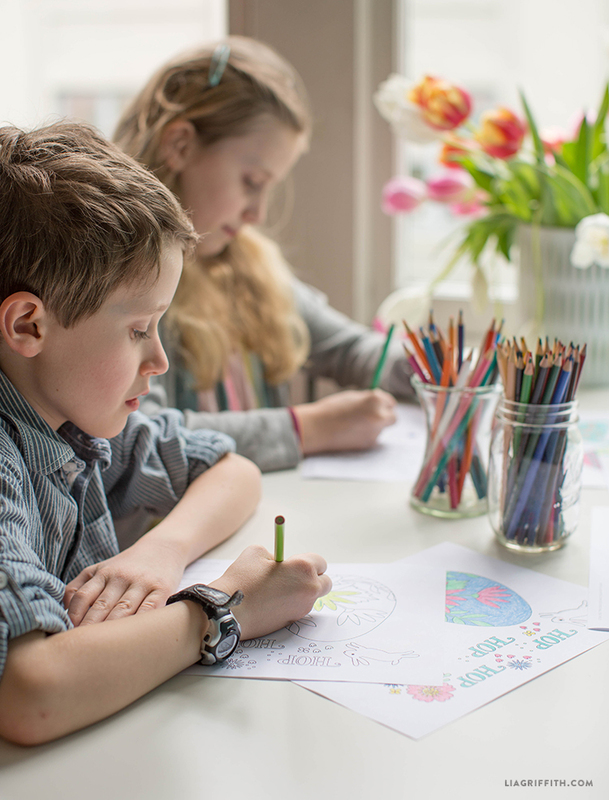 Watching the kids in your life enjoy Easter is one of my favorite parts of the holiday, so our illustrator Krista designed these adorable Easter coloring pages as a fun activity to keep your kids occupied while you and your guests enjoy your Easter Brunch! If you are setting up a kids table for your celebration, I love the idea of putting these Easter coloring pages on each place setting with some crayons or colored pencils. Or how about setting up a craft table full of different Easter activities for the kids? Such a fun and easy way to keep them entertained this holiday! Set up a station that includes these coloring pages, decorating easter eggs, making felt egg ornaments, and creating adorable yarn pom pom animals! 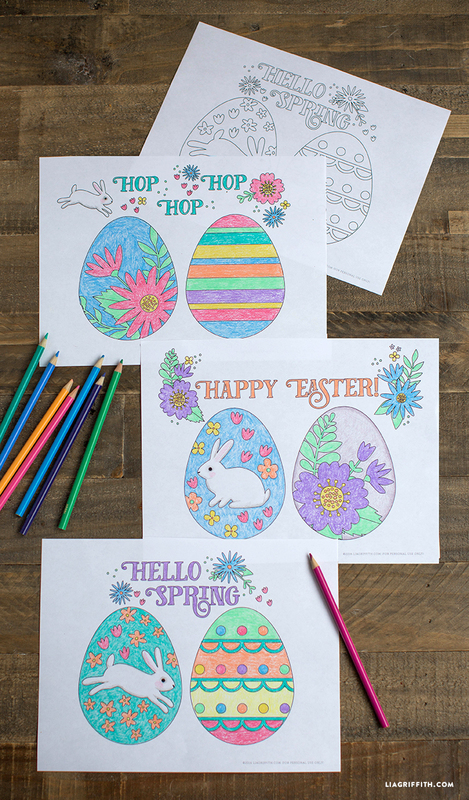 Simply print the Easter coloring pages PDF below onto regular copy paper and they are ready for your party! 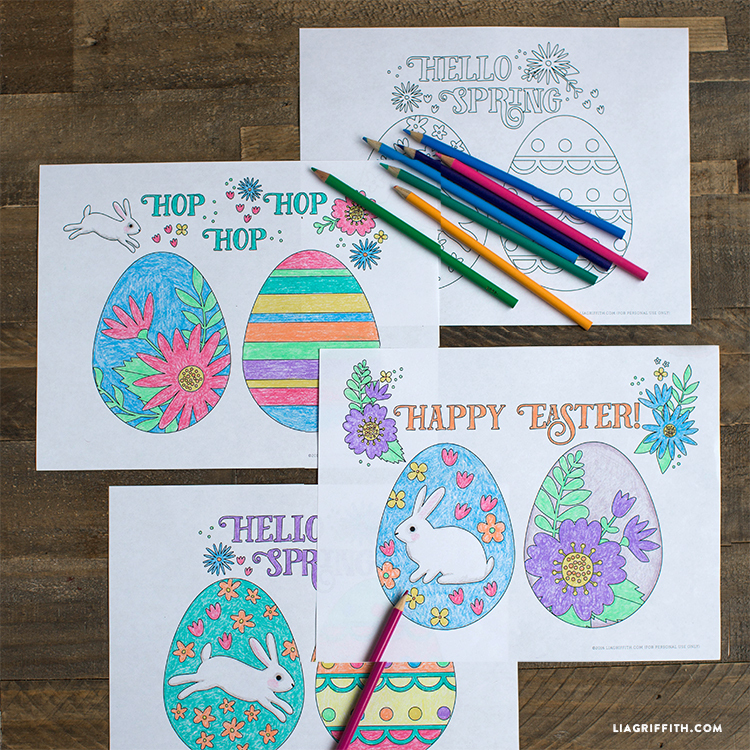 The download includes a variety of three coloring pages, each with two eggs and cute Easter phrases. Once the kids are done coloring, you can hang their artworks around the house, on the fridge, or create a cute garland with them! To make a garland, simply cut out the Easter eggs and attach them to a piece of string or twine with some tape or hot glue. These are so cute. While I’m not having children around for Easter, I am sending Spring/Easter cards to some dear friends. I printed these at a reduced size — 4 to a page from my laser printer. Laser printer ink works well with copics, so these will be perfect for the front on a few cards. Again, thanks for another great idea!! !